Today is All Hallows Eve. It is also Reformation Day. I thought of posting a letter by the most famous reformer, Martin Luther, but he is too fiery. 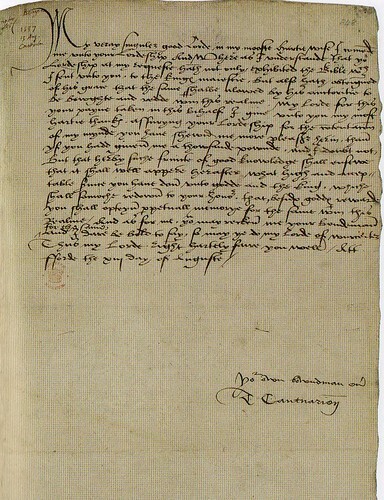 I was able to find a Getty Image of a letter by the English Reformer Thomas Cranmer, the Archbishop of Canterbury to Thomas Cromwell thanking him for obtaining Henry VIII's authority for the Matthew's English Bible. Cranmer is lesser known than Luther and Cranmer because his work did not bear his name. Luther started the Lutheran Church and John Calvin is known for Calvinism. Thomas Cranmer gave us the Book of Common Prayer. The Book of Common Prayer, The King James Bible and the works of William Shakespeare are considered to be the three underpinnings of modern English. I was able to find the transcript at Luminarium.org. Oh my the things you find and on Halloween of all days . We don't celebrate and we don't hand out candy either . We live way too far out and our street is horribly dark no street lights . Kingsburg's churches get together an host an event at the park near our house. Kids get loads of candy there and when that wraps up they come in mass down our street. We run out of candy every year then I sadly turn off the lights signaling that we're out of goods. I enjoy seeing all the kids and their costumes. It's loads of fun though a bit tiring answering the ringing of the bell for an hour. well you see one of our neighbors let us know that we should not waist our money buying candy because we never get trick or treaters because of the street being so dark and so far out that no one comes out our way . Those that do have kids load them up and take them somewhere else to go trick or treating .